1950's Massachusetts REJECTION sticker - $20.00 : Bob Hoyts Classic Inspection Stickers, Add a Final Touch to your Restoration! 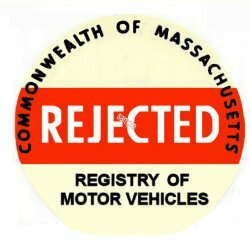 Massachusetts Rejection sticker issued thru the 1950's and 60's. Front of the sticker does not display the date but these stickers were pretty much the same until 1970. This sticker has been carefully restored and reproduced front and back, directly from an original. It has our patented "peel and stick" format to allow attaching to the inside drivers side of your windshield.